A sprained wrist is an injury to any of the ligaments which connect bone to bone in the wrist. 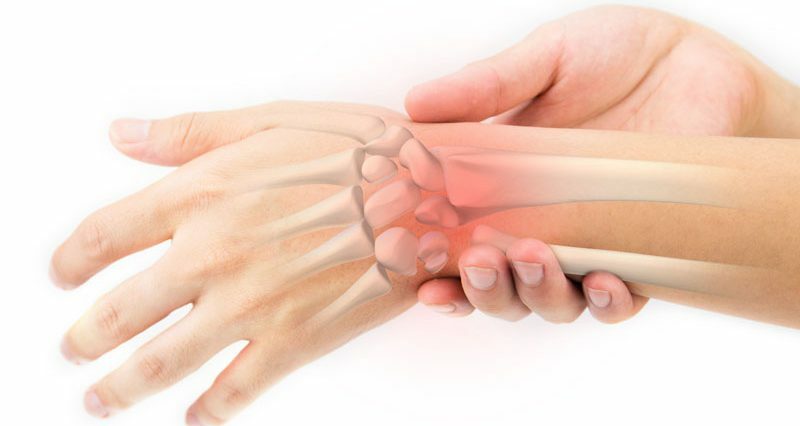 A wrist strain (or strained wrist) is an injury to any of the tendons which connect muscles to bone enabling movement in the wrist. Wrist sprain or wrist strain? Technically a strain is an injury to a muscle or tendon and is usually a small tear. A wrist sprain is a tear to a ligament which connects bone to bone. Many people refer to any minor pain in the wrist as a strain, despite most cases being either ligament or tendon injuries. An acute wrist strain may occur from a sudden force, usually bending the wrist quickly or beyond its natural movement or over leading it by striking a golf club or similar against an immovable object. A chronic wrist strain may be a repetitive strain injury, which occurs following repeated movements of the wrist. In this case, degeneration of the tendons in the wrist is more likely to be an accurate diagnosis rather than a tear. In theory, a strain is likely to be more painful when performing resisted movements as it is the muscle and tendon under load. A ligament will be painful when stretched passively. However, this may be difficult to distinguish with the wrist or both tendons and ligaments may be injured. A wrist sprain is a common wrist injury in sport, usually caused by a significant impact like a fall. There are different grades of a sprain, depending on their severity, but they can all cause significant pain. Symptoms of a wrist sprain vary depending on the extent of the injury and the location of the sprain. Sudden pain in the wrist will be felt at the time of injury and in more severe sprains a tearing or popping feeling may be felt. Pain will be felt when moving the wrist and a tender spot may be felt where the ligament is damaged. Mild swelling could be visible and bruising might develop in more severe injuries. A wrist sprain is quite a common injury, which usually occurs after a fall onto an outstretched hand. Other accidents or impacts can cause a sprained wrist, although it usually involves the wrist being bent either forwards or back. A sprained wrist doesn’t usually occur as an overuse injury. Gradual onset of wrist pain is more likely to be due to RSI or repetitive strain injuries such as carpal tunnel syndrome or tendonitis. Wrist sprains can vary in severity. A mild or grade 1 wrist sprain may involve the ligament being stretched. Moderate or grade 2 injuries are partial tears of a ligament and severe grade 3 injuries are full ruptures of one or more ligaments. Grade 3 injuries may also involve an avulsion fracture where a fragment of bone is pulled off with the ligament. It is important to get all but the mildest of suspected wrist sprains assessed. Even a minor sprained wrist can result in prolonged and recurring pain and disability. A doctor will assess the wrist, looking for swelling, bruising, deformity, tenderness, pain on movements etc. They will also ask about how the injury happened and any previous injuries to the area. A referral may be made for an X-ray or MRI scan to rule out a broken wrist and to observe the extent of the injury. Most wrist sprains can be treated initially at home using the PRICE principles of protection, rest, ice, compression, and elevation. Protect the wrist from further damage. Wear a wrist support or splint to protect the joint and reduce movement. Rest is very important. Do not keep using the wrist as this will only cause additional damage. Apply ice or another form of cold therapy as soon as possible to reduce pain, swelling, and inflammation. Repeat every 2 hours. A simple hot/cold gel pack is ideal as long as it is secured properly. Using a compression bandage or support will help reduce swelling. The sooner the compression bandage is applied the better. Cohesive tape or bandage is ideal as it is elastic and sticks to itself. It is easy to apply. Do not leave a compression bandage on for more than 10 minutes at a time as it may restrict blood flow. Raising or elevating the wrist above the level of the heart will also help reduce swelling and encourage excess fluids to drain away. More severe injuries may require immobilization in a splint for 1-2 weeks to allow the ligament to heal. After this period the wrist may feel stiff so a mobility and stretching programme is important to get the wrist moving again. Wrist strengthening exercises can also be performed to strengthen the muscles surrounding the wrist which helps to support the injured ligament. Surgery is sometimes required following full ruptures or those where there is an associated fracture. The procedure usually involves re-attaching the ligament to the bone. If there is a fracture, this may also have to be fixed in place with wires or pins. The wrist is then put in a splint or cast for around 6 weeks. A rehab programme should then follow to regain full mobility and strength. A wrist strain is a general term used to describe pain in the wrist. The pain may be due to a sudden force causing an acute wrist injury, or due to overuse, causing a repetitive strain injury. The area can feel tender, especially when moving it. Because of this, complete rest is the best treatment for recovering from a strain. Symptoms of a wrist strain include pain in the wrist which may develop gradually or suddenly. There may be a specific area which feels tender to touch and swelling may develop. Pain is likely to be reproduced when moving the wrist against resistance. An important part of wrist strain treatment is to rest from activities which aggravate the injury. Apply the PRICE principles in the acute stage of protection, rest, ice, compression and elevation. Ice can be applied for 10 minutes up to every hour for the first 24 to 48 hours which is usually long enough for the acute stage to pass. Ice should not be applied directly to the skin but wrap in a wet tea towel. Commercially available cold wraps are often more convenient. Your doctor may recommend taking ibuprofen to ease inflammation and a sports injury specialist may use electrotherapy treatments such as Ultrasound. If the swelling is present apply a compression bandage or support. A simple tube grip or elastic bandage is fine initially. Later a neoprene wrist wrap is good for providing support and retaining heat which will help the tendon heal. For chronic or persistent cases cross friction massage may help by reducing the tendon back to its acute stage so it can heal properly. Once pain has subsided, strengthening exercises can be performed to prevent it from happening again. In particular putty exercises and hand therapy balls can help with wrist strengthening as well as specific flexion, extension and lateral deviation exercises with dumbbells or similar weights.